Crimson sketch– dr. no. revelations in the brig. A long day didn’t begin to describe it: Skedcomm management was half way up the gang plank before Crimson had finished handing over their catch. There was a loud amount of bickering, denial, and finally feigned cooperation as the Galactic Precinct’s authority weighed heavier and heavier on the crooked mining company. Crimson called out the strength of her crew, and ordered a full search of the Irglekerrg’s cargo bays; only Keffler, Braevel, and Tager stayed behind to help Jumondo—even Olper quickly redressed and returned to case the filthy station. They ID-ed two more convicted salvers from the pile of groaning bodies in the black market surgery. Gator cross-referenced Qualvana’s Most Wanted for any other potential marks, and Micron’s android police programming picked another criminal from the ranks of Skedcomm cargo personnel. Skedcomm security and PR Department followed them around like innocent puppies denying responsibility and pretending to help. Crimson threatened all of them with convictions for abetting, using Micron’s Active-Recording Mode. As far as she knew Micron had no such capability, but it kept Skedcomm quiet. Then, with hand scanners they searched the sensor-dampened passages and holds until they found their crews’ credentials, and confiscated copious files from the black marketeers’ computers. When it came to the other slaves who’d been with Olper and the others in the transport, Crimson’s Mindframe drew a blank. “Get these people out of here. Take them to Keffler.” She’d figure it out later. Skedcomm management tried one more time to cajole them, offering to take care of the slaves, and set them up with proper employment. Nearly blind with rage, Crimson immediately sent Andross back to the Rival Bay to ‘burst the entire story to every news agency in the Khibarra System, with orders to crucify Skedcomm. In 31 minutes the Linkburst was sent; in 39.7 minutes Species Rights activists were already bombarding the Skedcomm offices with boycott pressures. The brig was dark. The Rival Bay was designed for over 300 passengers making a voyage of multi-hundreds of years, a relic from BLS (Before Light-Speed)—before the Kladerine Collective’s Jump drive was parsed out to species across the galaxies. For 300 space colonists, Crimson always thought the 15 cells were rather hopeful. Forcefields were expensive; whatever systems the Rival had before it was junked was carried off by salvagers had been scalped on the Pawn Market a century ago. She and Gator had welded in wrought iron frames and installed their own barred doors, reminiscent of some old west pokey from ancient Earth I’s fabled cowboy legends. Eleven cells lay empty. The three minor convicts she’d had Shaak-Rom shove in the front three blocks. She’d saved the last cell on the strip for Lomblurrg. It was narrow, due to a conduit passing behind the bulkhead, and isolated from the rest, furthest from the dim light source over the brig’s entrance. Crimson clumped past the three nobodies, with mechanical indifference to their curses and quips. It was late. Shaak-Rom was off duty. The dull thud of her boot and clank of her robot heal made an eerie sound in the honeycomb of empty cells. Lomblurrg stirred on his wall-mounted slab. The Grotassa was slighter than the average for his species. His pale skin, bald head, and tentacled face bobbed in the darkness, an apparition of some weak spawn the under-god Cthulhu. Crimson stopped outside the barred door. Inside she felt her Mindframe struggling to receive the barrage of impulses her senses fired off. Rage. Fear. Disgust. Revenge. Hate. She detested the loathsome surgeon. But like a magnet she’d been drawn here. It was like straining to see a dead body while passing a wreck; she felt inexplicably compelled to look. To poke with a stick. Crimson’s Mindframe lagged. How did he know? As if reading her broken silence he levered himself up and hobbled forward. “I saw you,” he replied, “on the station. I saw you in my operating room.” Like all Gortassa the words bubbled and slurped through the net of nose tentacles, but there was a slimy triumph to his voice. He continued, “I thought, ‘Is that one of my children? Come for vengeance?’ But no! You… you are another’s daughter.” His pale fingers wrapped around the bars, and he pulled his face close. Tentacles reached through the air sniffing for answers, reaching for her metallic shoulder. Crimson slowly resisted the spellbinding magnetism of her own masochism. Languid as fly in syrup she pulled a step away. Crimsons anger closed like a vice. 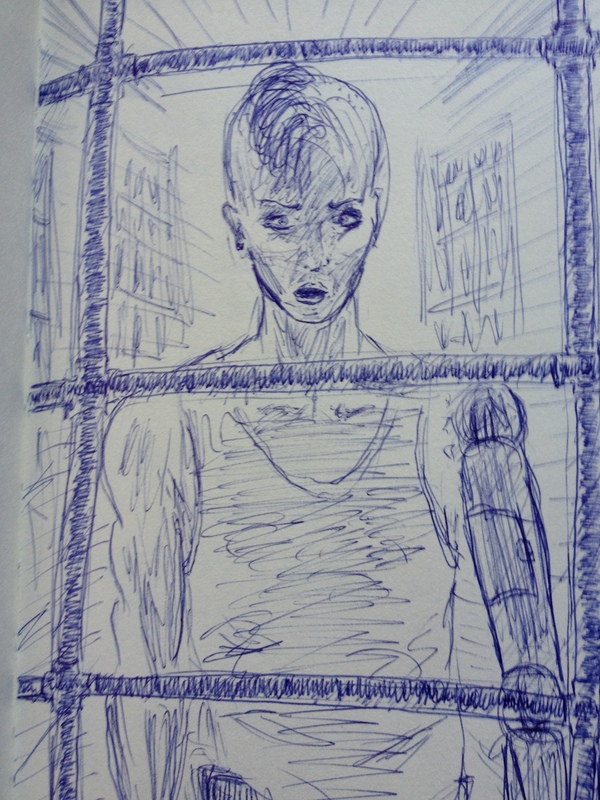 With a wham her left hand slammed into the bars and bent the closest horizontals. Lomblurrg jumped back. Crimson felt her anger slipping beneath a cold raincoat of fear. “What are you talking about? !” She said, her voice climbing a decibel. She raised her robotic arm again in a useless gesture. Lomblurrg’s eyes followed it in keen interested, but no fear. “Snake!” Crimson shouted, shaking the door again and turning away. The other prisoners jeered and shouted from the far end of the brig. Her Mindframe did the calculations in a flash. She wouldn’t find the keys in the warden’s desk outside the brig. Shaak-Rom was too smart for that. Lomblurrg was too far out of reach to wrap her fingers around his gloating tentacles and pull his smug face into the bars. Her titanium-and-steel casing would take too much damage to break open the cell. She would never release him. She could not interrogate him. Livid frustration outweighed her curiosity by a factor of 10. She spat. It reached the corner slab of the slab, and Lomblurrg twitched his hand away. She turned and stalked out. The other criminals were only just fast enough to withdraw their hands before she smashed their knuckles. She left the brig behind.